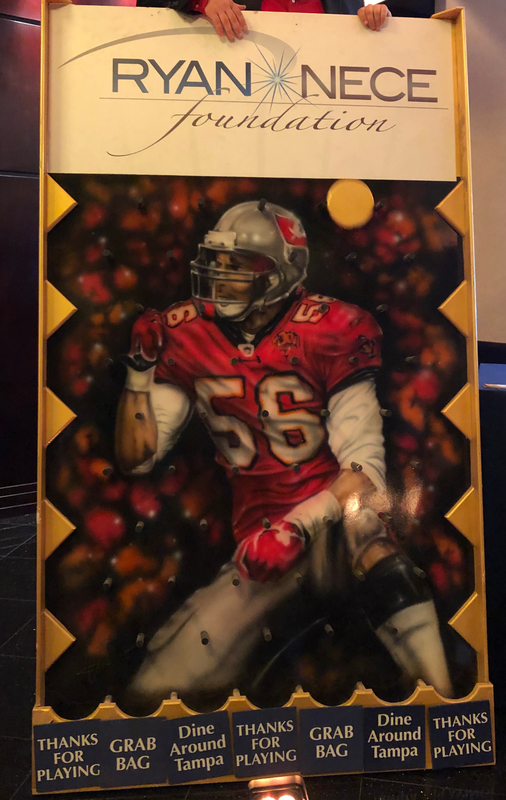 The Ryan Nece Foundation, founded by former Tampa Bay Buccaneers player Ryan Nece, hosted the 10th Annual Power of Giving Holiday Party this December. The party is always one of the top events on Tampa Bay calendar each holiday season and 2018 was no different. The event raises funds for the Foundation's programs, which focus on empowering and mentoring teenagers. The Power of Giving holiday party, presented by the DeBartalo Family Foundation, was held on a beautiful evening at TPepin's Hospitality Centre. The event featured a silent auction (I won the bid for Gasparilla Bowl tickets), food from some of the top Tampa Bay restaurants such as Seasons 52 Wine Bar & Grill, Eddie V's Prime Seafood, Metro Diner, Chef Inspired Popcorn Company, whiskey samples from Irish 31 and an open bar sponsored by Pepin Distributing Company. There was an incredible dessert table from Seminole Hard Rock Hotel & Casino Tampa, including items decorated with Santa. This was the first time I attended the Ryan Nece Foundation's Power of Giving Holiday party, I had an amazing time. It is nice to know all these Tampa Bay area companies and people were coming together to support charity efforts in the community focused on mentoring the next generation. Guests could also try their hand at casino-style games and my personal favorite, Plinko, for a donation to the Foundation. Winners of the "Dine Around Tampa" Plinko item could choose from free items PDQ, Eddie V's Prime Seafood and Seasons 52 Wine Bar & Grill. For the record, I won all three times I played Plinko. 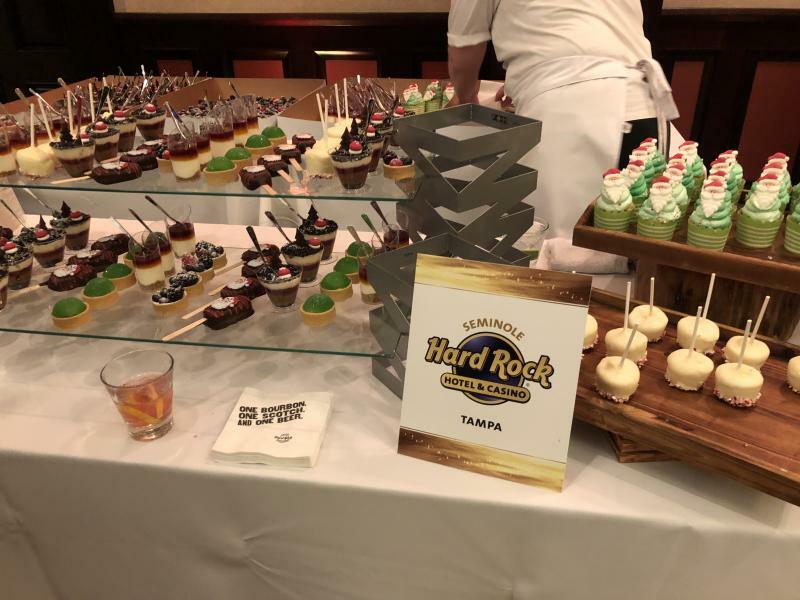 Seminole Hard Rock Hotel & Casino Tampa's dessert table at the Power of Giving Holiday Party. The vision of the Ryan Nece Foundation is to empower teens to become leaders and impact giving in their communities. The foundation’s mission is to create opportunities for teens to embrace the Power of Giving through volunteerism and inspirational leadership programs. Nece gave a passionate speech about his belief in the power of giving and encouraging the attendees to give their time and efforts, as well as financial support, for causes bigger than themselves. Stay tuned for an announcement on the date for the 2019 Ryan Nece Foundation Power of Giving Holiday Party and make sure you are there. You can learn more about the Ryan Nece Foundation's programs and events at their website. Want to stay up to date on all the latest events, restaurants and more in Tampa? Stay plugged in with 813area.com, sign up for our email list and get all the best things to do in Tampa sent directly to your inbox.